Art Style: Light Trax (aka Art Style: Lightstream) takes racing to whole new (and very surreal) levels as you control a white beam of light moving perpetually forward while your viewpoint shifts between 2-D and 3-D perspectives. Start by choosing one of the two main modes of game play, each with its own distinct goal. In light tours mode, you vie with other light beams for the most points in a three-course racing tour. Watch out for obstacles, use items and strategically use your dash ability to finish first. In freeway mode, your objective is to set a high score by traveling the greatest distance within a set amount of time. Mastering the intricacies of each setting is crucial: you'll have to alternate between them in order to progress through the game and unlock all of its modes. With precise controls packed in and a driving techno soundtrack, Art Style: light trax offers an experience unlike any other. Are you ready to compete in a mind-bending race at the speed of light? Games in the Art Style series feature elegant design, polished graphics and pick-up-and-play controls, creating an experience focused purely on fun and engaging game play. 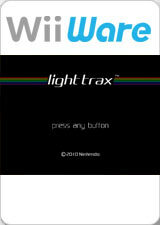 The graph below charts the compatibility with Art Style: light trax since Dolphin's 2.0 release, listing revisions only where a compatibility change occurred. This page was last edited on 17 February 2018, at 11:20.